Make a gift, gift wrap, gift box, gift bag, gift tag, you get the idea! We are showcasing My Favorite Things Products this week. You don’t have to use them to join in but if you have them we would love to see them used. 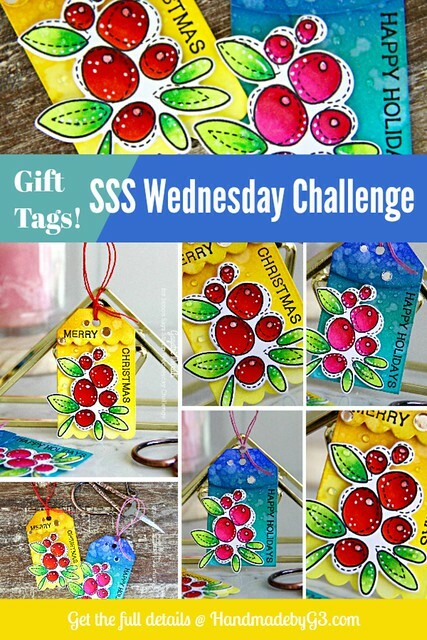 I used MFT’s Tag Builder Blueprints 2 to make my tags for the challenge. 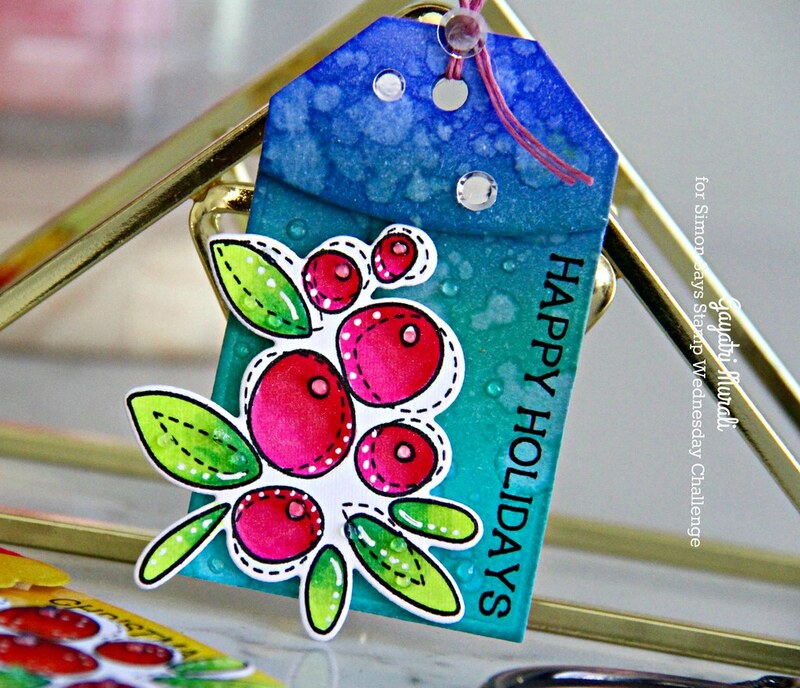 I used the scallop edged tag and the flat edge tag from the tag builder set. I die cut them using white cardstock. 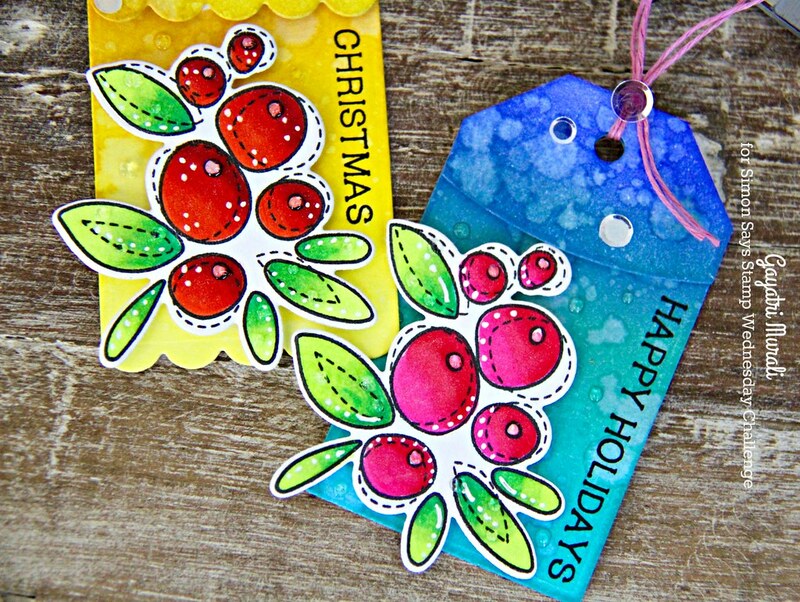 Then on one tag, I sponged Squeezed Lemonade, Mustard Seeds and Fossilized Amber distress inks and on the other, I sponged Peacock Feathers, Evergreen Bough and Blueprint Sketch distress inks. 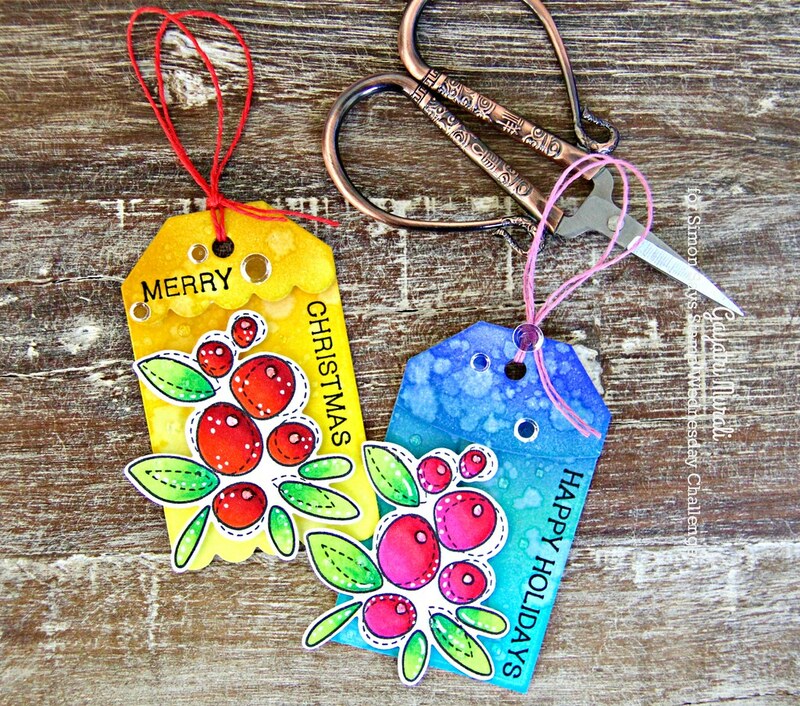 I also die cut the tops of the tags in white cardstock and sponged them with Evergreen Bough, Blueprint Sketch, Mustard Seed and Fossilized Amber distress inks. To add texture, I spattered them with water and dabbed the excess off. 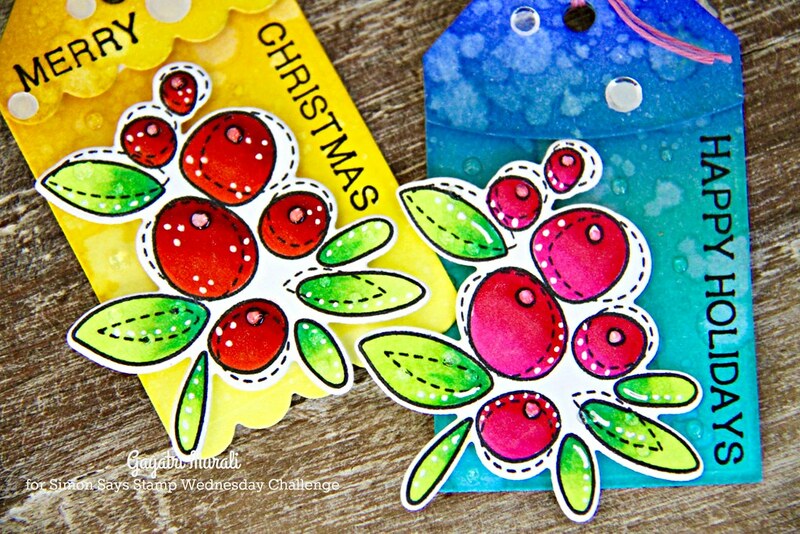 My favourite thing to do with distress inks sponged background. Once the background is dry, I adhered the tops of the tags using foam adhesives. 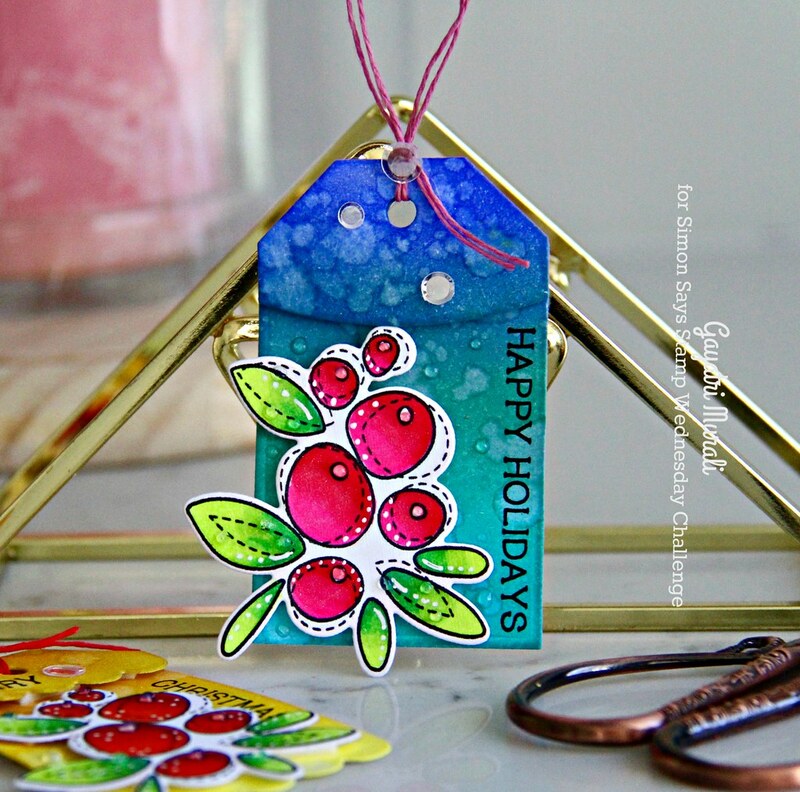 For the focal point, I used Simon Says Winter Flowers Stamp stamp set and coordinating dies. I stamped the berry cluster with Simon’s Intense Black Ink and coloured them using copic markers. 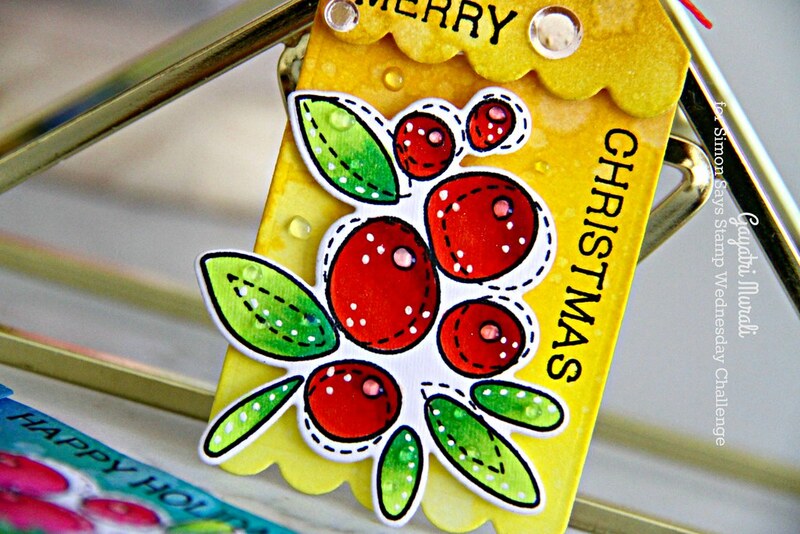 Then added interest using white gel pen and glossy accents for dew drops. I then die cut the cluster using the coordinating dies and adhered on the tag using foam adhesives. For the sentiment I used Simon Says Stamp An Arctic Christmas stamp set and simply stamped the sentiment in Versafine Onyx Black ink and mini MISTI. 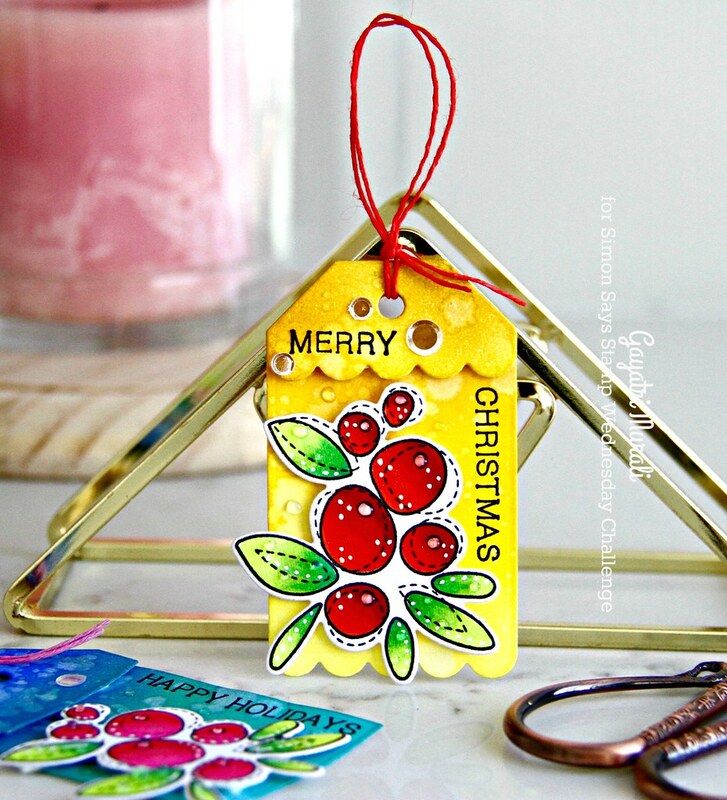 I used coloured twines to tie the top of the tags and embellished them with glossy accents and Moonshine Confetti sequins from Simon. Here are photos of the individual tags and closeups. I love how these tags turned out. Love the bright colours. Hope you do too. If you like to bookmark my tags, here is the image to pin. Thanks for stopping by my blog today. See you soon with another post. These are wonderful!! Love how bright and happy they are!